It’s math. It’s baking. It’s gluten free, egg free, and soy free! It’s homeschooling, unschooling, and really quite tasty. It has chocolate and chemistry! It’s just the most perfect activity ever. Inspired by Evil Mad Scientist, who we met a few years ago at the SF Area Maker Faire (and enjoyed their bristle bots quite a lot too), we decided to tackle them. I’d put it off, since I wasn’t so confident in my gluten free baking. But the Gluten Free ratio rally fixed that! We kept putting the dough in and out of the freezer to help it not get too squishy, but if it was in there too long it got brittle and hard to roll. So…. yeah, this was challenging! Anyway, you break the vanilla dough into 8 equal parts and roll into snakes. Break the chocolate dough into similarly sized pieces and roll into similarly sized snakes. Then, make the snakes all square. Then, build the first pattern, with the 8 vanilla pieces arrange around the chocolate in a square shape — imagine a phone dial pad, where 1, 2, 3, 4, 6, 7, 8, and 9 are vanilla, and 5 is chocolate. Cut a few squares from this roll. Next, cut the remaining log into 8 equal pieces, roll out, and make square snakes trying to keep the pattern the same! Sort of the way they make hard candy with shapes in it… Arrange those 8 around a new chocolate snake. 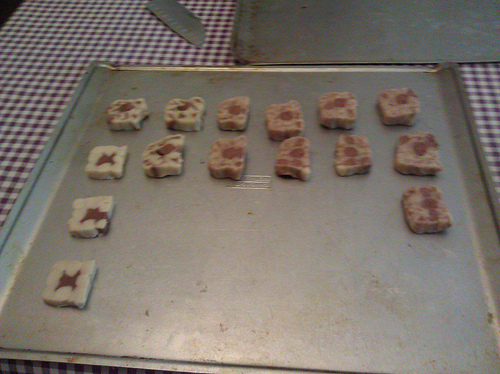 Cut more cookies, this time with a big chocolate square, and many tiny squares with a chocolate dot in them. Repeat until you can’t stand it. 🙂 Bake them all for 15-20 minutes. Enjoy while thinking about the recently departed Benoit Mandelbrot and consider growing some romanesco in his memory. It’s just a great sensory activity that involves plenty of weighing and measuring, fine motor skills, and abstract math concepts that works for kids (and adults!) of just about any age. Edited: Removed “dairy free” because, well, it has butter. You could use shortening or lard or any other solidish fat. Next time I’ll try cutting in a little cream cheese, I think.